A common setting on many digital cameras, RAW is a filetype option many professional photographers prefer over JPG, despite a huge disparity in filesize. Find out why, what RAW is, and how you can benefit using this professional quality filetype. 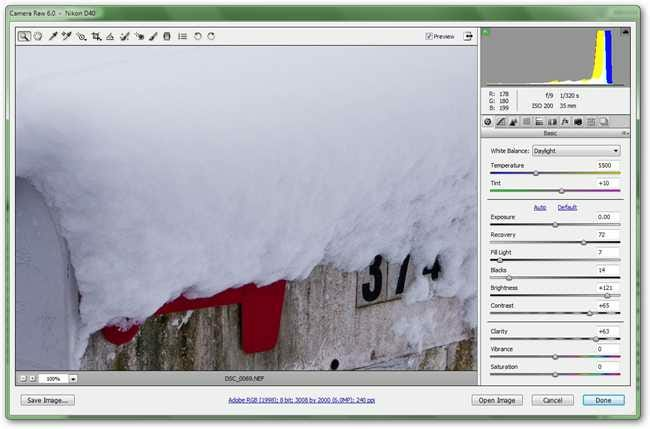 RAW is an answer to the limitations of the JPG file format, the original filetype developed specifically for digital photography by the Joint Photographic Experts Group. When shooting in JPG, a combination of you and your camera make decisions about the kind of information captured and stored as a digital file. When shooting in JPG, these decisions are processed and rendered, and then defined in the limited number of colors of an RGB color space. What does this mean? While it may seem like it means that it is simply an uncompressed file format, you would be wrong. Well, you’d be right and wrong, as RAW is not compressed the way JPG is, but it is far more than a file free of JPG artifacts. 24 Bit RGB, the most common format for digital JPG photography, is more limited than the full spectrum of colors your eye can see. Any color space (aka color gamut) will be. Depending on the camera, RAW files literally capture a larger range of color, and provide minimal in-camera processing, allowing for photographers to later condense image information as they see fit later, rather than the camera sees fit in the moment of shooting. Confused? Keep reading, as it can be hard to explain the reasoning behind RAW in a single section. RAW is a minimally processed format. “Minimal Processing” means less decisions made on the fly and less information thrown away when an image is taken. This gives photographers the level of control similar to working with film negatives, except with greater and more dynamic control, as RAW is digital. When images are shot onto light sensitive film, no matter what processing is done, light has struck that light sensitive film, and a clever photographer could under or overdevelop film, or dodge and burn prints in order to bring out the value range and colors of the light that literally hit the film. RAW is based on a similar idea. JPG is sort of like the final product; a print already made from a negative—a static final product. RAW is more of a simple record of light traveling through the lens, the way a negative is a record of the light that hit it as the aperture opened. While it is rendered in pixels, those pixels have much more “behind the scenes” information than you might think looking at that RAW image in your digital SLR display. As there is no single digital camera, there is no single Camera RAW. Each camera has its own method for capturing Camera RAW, and so create their own proprietary filetypes. This makes processing them (or even opening them) notoriously difficult, particularly without newer versions of high-end digital photo software like Photoshop. Even older versions of Photoshop may have trouble opening some exotic varieties of Camera RAW; possibly even new versions of Photoshop, as well. There are plug-ins and software updates to counter this problem, but popular name-brand cameras (for instance, Nikon or Canon SLRs, pictured above) will have well established RAW formats that programs like Preview or iPhoto (Mac) or Picasa for Windows will be able to open and view. However, simply viewing RAW files is of no benefit—you’ll need to process them to understand what is truly great about them. Remember that Photoshop isn’t the only game in town for opening and processing Camera RAW—Adobe Lightroom also has good support for processing and similar tools for adjusting White Balance and “developing” your digital negatives. It is also a considerably cheaper retailing product, and can be a nice midway step for the photo enthusiast that isn’t ready to make the commitment of a full license for Photoshop. Your eyes are exceptionally good at adapting to changes in light, much more so than cameras, which are generally calibrated to photograph in well-lit conditions of pure white light, like that from the sun. Besides being able to see in relatively low levels of light, one of the things most of us tend to miss is the color of the light cast by color sources. When photographers used to have to use film, they would have to meticulously plan out what color light they would be shooting in and buy and use film of a specific temperature in order to ensure that their photographs did not end up with a color cast over them undetectable by the human eye. Fortunately, not only do modern SLRs have the ability to switch effortlessly from one white balance setting to another, most of them will select a white balance setting for you without you even being aware of it. But RAW files do not have the option of picking specific white balance settings. Why? Because it captures image information in all white balance settings. Shooting images in Camera RAW will allow a photographer to adjust image temperature and white balance over and over again without damaging the image information in the file. Control over white balance is a huge coup for photographers, and being able to adjust and counter for the nearly invisible effects of light can help even amateur photographers get very quality shots. Another advantage of RAW are the increased color space. Standard RGB files are 24 bit, with 8 bits (or 256 colors) per channel. RAW files are 12 bits for each color channel, creating a 36 bit RGB file. This allows you to process your file’s rich content and create final images that have excellent value ranges after being processed. 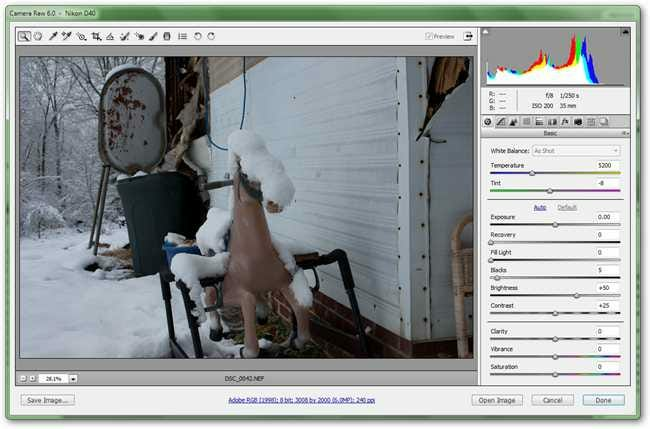 Take a look at the photo above being processed in the Photoshop Camera RAW program and keep reading to understand more. 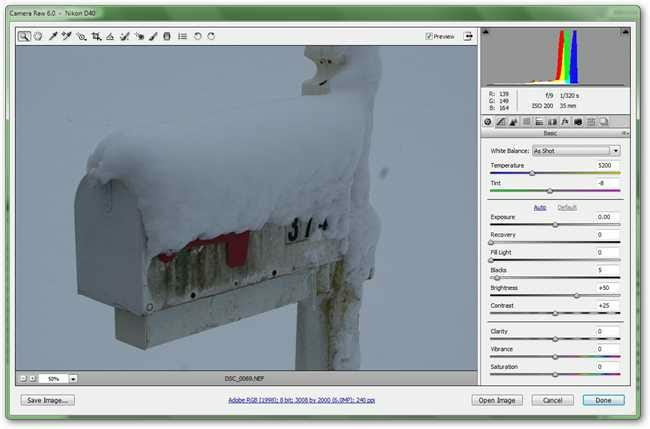 With some fairly simple editing, picking the proper white balance, and basic adjustments, our Camera RAW image shows texture in the whites and grays of the snow, as well as a range of colors and various texture in the grays of the mailbox. Since this is working from the larger color space, RAW files have an excess of information and throw away what they don’t need based on the decisions you make. You can think of it as redrawing your image based on the decisions you make, using the original snapshot as a starting point. 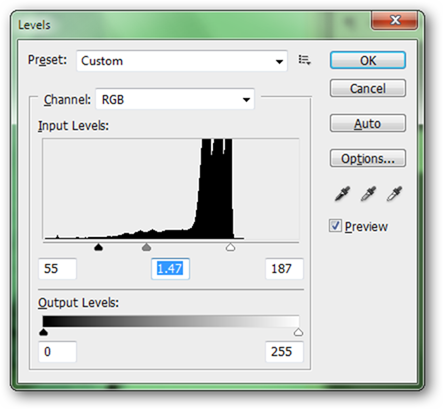 Photoshop tools like Levels can provide some of this functionality, but are a poor in comparison. Working with a 24 bit JPG and Levels simply squeezes or compresses based on what little information is already available. Exaggerating the Levels of a JPG image can give you the impression of increased detail in some areas, although it throws away color information you may not intend to lose. Notice how the grime and stains on the mailbox lose detail when the detail in the snow is brought out. It is true that a photographer may want this gritty, dark look—but throwing away detail can often be very problematic. This image, processed from RAW, has subtle detail in the white of the snow, a good range of value from light to dark, and loses a minimum of detail in the dark areas. While it is possible to achieve good results working exclusively with JPG, it is far easier to keep detail in an image that moves from a larger color space to a smaller one. RAW is, in a nutshell, the “Live” art file of the photography world, similar to how a vector art file or layered image file will give you the maximum ability to do additional edits. Remember, any changes you make to a 24 bit image in Photoshop are merely condensing or squeezing the information—RAW will always start with too much and throw away what you don’t need. Even if you don’t really care to be a professional photographer, there’s no reason RAW can’t work for you. Image Credit: Steak by DSCF-Photographer, available under Creative Commons. Negative by ollycoffey, available under Creative Commons. All other images either by the author Eric Z Goodnight or Brad Goodnight, protected under Creative Commons.